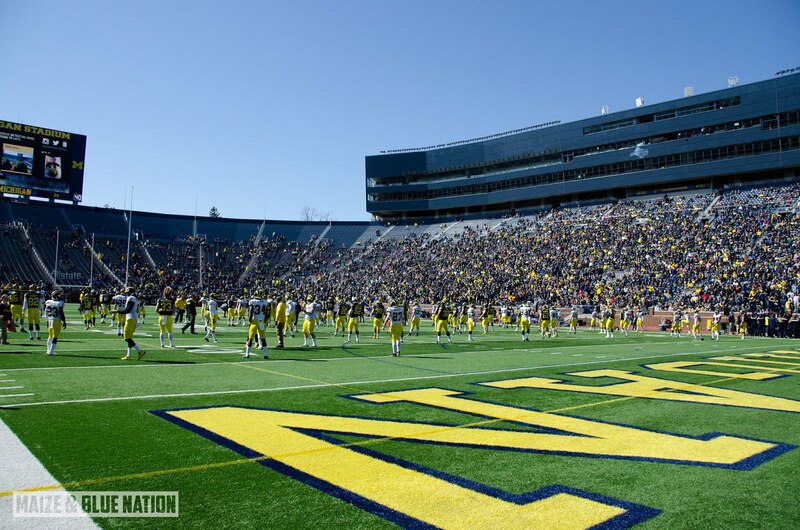 The University of Michigan football team will host its annual Spring Football Game presented by PNC Bank on the evening of Friday, April 1, from Michigan Stadium. The exact start time will be announced at a later date. The spring game is free and open to the public. The gates to the Big House will open one hour prior to the start of the game. Additional information will be forthcoming regarding parking, stadium entry locations, concessions and other activities for April 1. The Wolverines will practice a total of 15 times during the spring which culminates with the first-ever spring game scrimmage in the evening. The game will be televised by the Big Ten Network. The football team will conduct its first spring practice on Feb. 29 in Bradenton, Fla.
As noted, exact time will be announced, as well as television coverage...which I assume will be handled by the Big Ten Network. No other specifics were announced in terms of how much an actual "game" this spring game will be...but I suspect we'll hear more as spring practice progresses. The April 1st spring game will give Michigan football players a full 19 days between the end of spring practice and final exams. However, unpredictable Michigan spring weather could have a dramatic impact on this event, especially after the sun goes down.